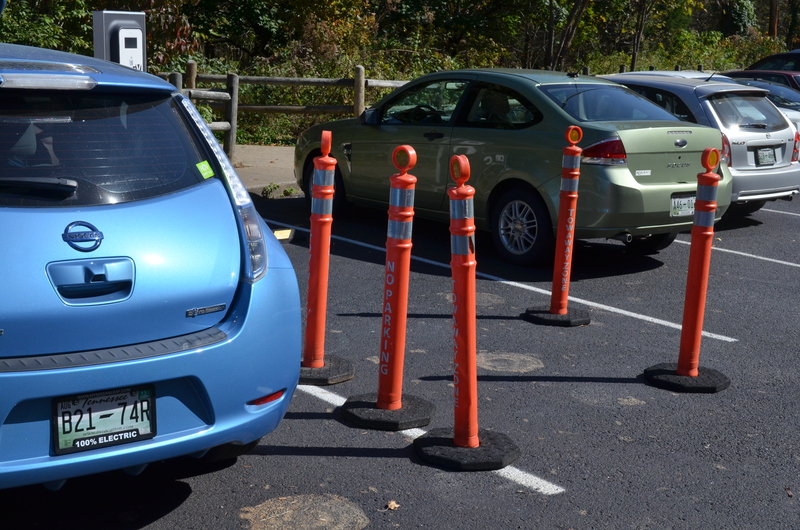 “No Sir”, said the kind staff member at Radnor Lake State Park Visitor Center, “You cannot park your LEAF in either of the EV spaces, they are not working”. While the state of the charging stations was regrettable, I was merely seeking permission to park. I was concerned by the “Tow Away Zone” signs in the spaces. Sunday was a very popular day at Radnor, it was a really beautiful day and we had queued for over 10 minutes waiting to get into the parking lot with little hope a space opening up. Lo and behold there were two empty spaces for EV’s. Yippee!! After a brief conversation, the staff member was kind enough to call the Ranger on a walkie talkie and asked on my behalf. No was the answer. She explained I did in fact have an electric vehicle. The answer was still no. No Parking Except for Electric Vehicle Charging reads the signs, and they mean it. Literally!! The staff member sympathized with me, and was awfully nice, but was powerless to help. She went on to explain that she too as a staff member had problems parking after returning from lunch. She asked permission as a staff member to park in one of the EV spaces and was denied as well by the ranger. I asked her if she had an Electric Vehicle. No was the reply. I suggested that was probably the reason she could not park there, the spaces are for Electric Vehicles only. 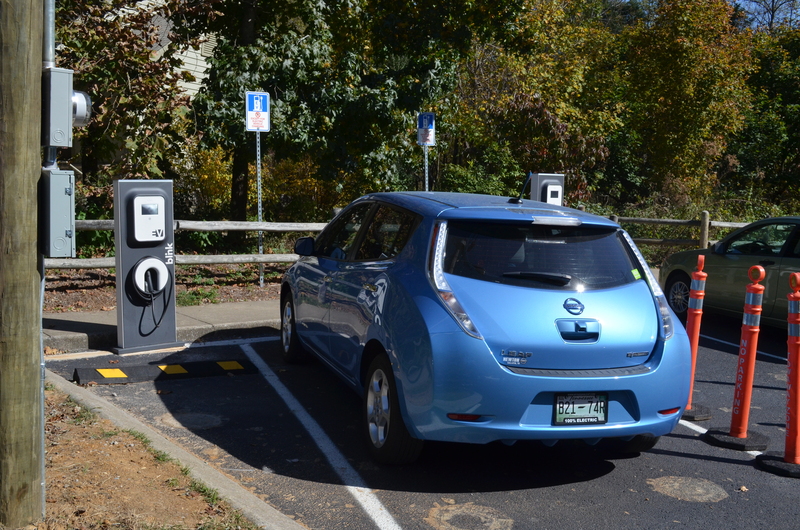 If one reads the signs carefully at the park they say “No parking except for Electric Vehicle Charging”. So in a literal sense the Ranger is right, since it’s not possible to charge ones car if they are not working, the spaces are off limits. However one would think given that parking was at a premium the Ranger would want to use every available space possible to allow the public to enjoy the park. We did see a black LEAF parked in a regular space as we pulled into the park. That space could have been free for another visitor to the park in. 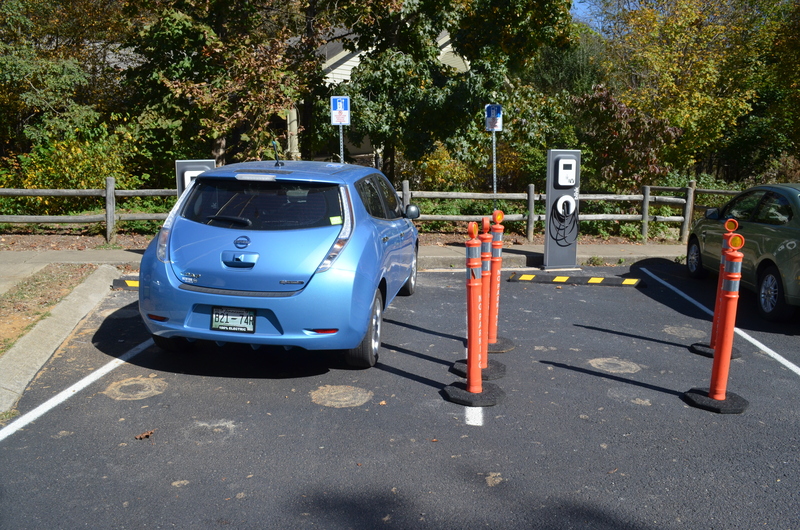 It would seem no one at Blink Networks have explained to the Park Rangers that the charging stations attract a fee for the length of time you occupy the space, not the amount for time actually charging nor the amount of electric consumed. Occupancy is the yardstick. The bollards read “No Parking, Tow Away Zone” so we moved on. We didn’t get to enjoy the park after all. Both east and west parking lots were hopelessly oversubscribed. 54 mile round trip for nothing. At least it didn’t cost too much in gas. Apparently the state park rangers, as civil servants, are not attempting to provide good service to those who pay their wages. A Park Ranger has the power to ticket / arrest anyone violating park rules and ordinances. It is this power that often inflates and fogs their minds. Sad but true. A.K.A. Little Hitler Syndrome. This reminds me of a UK TV show, “That’s Life” hosted by Esther Rantzen. At the end of each show they would run a humorous spot highlighting government employees that refused service through overly zestful rule enforcement. The spot was called the “Jobsworth Award”, the award going to a hapless government employee each week. It was called the Jobsworth award because when asked to explain the reason behind their draconian rule enforcement, they would often say “I’d like to help you, but it’s more than my jobs’s worth”. Logic does not prevail for those worthy of the “Jobsworth Award“. Either side of the Atlantic so it would seem. This week’s Jobsworth award goes to the Rangers at Radnor Lake State Park, Tennessee. This entry was posted in Blink, Customer Service, Electric Car, Level 2 EV Charger, Nissan LEAF and tagged ester rantzen, jobsworth, little hitler, radnor lake, Radnor Lake State Park, that's life. Bookmark the permalink. Yes because Hitler was well known for denying electric car owners their lawful right to park in EV parking spaces. And some other stuff.